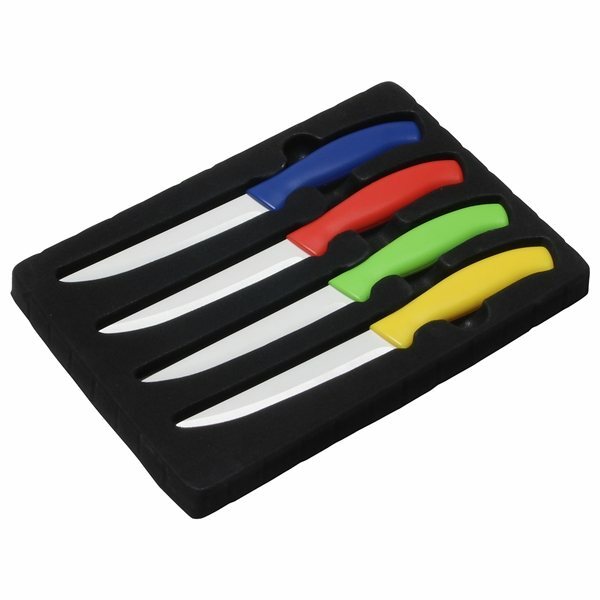 Set contains four knives with exceptionally sharp serrated ceramic blades. Each knife features a different handle color: blue, red, yellow and lime green, each with a white blade. Product was good, but service to get the item was outstanding. Great advertising tool. High quality. thanks for the special offer and quality product the quality was excellent! Our customers where thrilled at the style! Item was precisely as displayed. Great service! Perfect lanyard! Precisely what I purchased and rapidly done. It sticks out among other free gifts, creates perfectly, feels safe and inventive. the last two products we ordered were very well done and definitely met our expectations.